What would a tire swing be without a branch to hang from? How about a summer picnic with no shade, or summer adventuring without camping in comforting forests? Scouts and nature lovers alike understand the feeling of calm and sense of home within dense woods. As a society, we depend deeply on the resources provided by nature — for our enjoyment, our luxury and our survival. The role of forests is vast. From maintaining balanced ecosystems that are home to Mother Nature’s diverse creatures, to regulating climate, to providing experiences for youth to connect with nature, forest conservation is key to creating a secure and improved world for tomorrow. We should all share the responsibility of ensuring our forests stay lush and strong to benefit future generations. Where better to start contributing to forest conservation than within the Scouting community, where youth strive to enjoy, explore and protect nature every day? Protecting forests is important to me. Looking beyond the day-to-day enjoyment that trees provide as nature’s playground, trees can also benefit our long-term well-being. 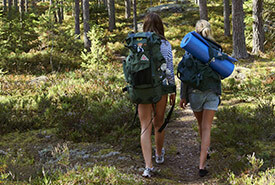 As a teenager, I feel the pressure of educational expectations, but as a Scout, I find that forests can be a natural stress reliever and mood booster. The Smart Living Network explains how immersing ourselves in green spaces can help reduce the levels of stress hormones, such as cortisol, and improve our immune system. Plus, forests can have a positive impact on depression and anxiety. Through principles like Leave No Trace and EnvironMentality, Scouting has helped me discover that forests are crucial to the existence of life. We rely on them as a natural resource for fuel, construction materials and oxygen. Unfortunately, as a commodity in high demand, we have been losing forests. According to World Wildlife Fund (WWF), the rapid consumption of forests not only affects natural resources and wildlife, but also contributes to climate change. The United Nations' Food and Agriculture Organization reports that half of the world’s tropical forests have been cleared. WWF also reports that deforestation is causing 15 per cent of all greenhouse gas emissions. Despite the current challenges, we can all still make a difference. Each year, Scouting youth work together to bring the Scouts Canada vision of “making a meaningful contribution to creating a better world” to life. For example, Scout groups help revitalize local forests through Scouts Canada’s Scoutrees program. 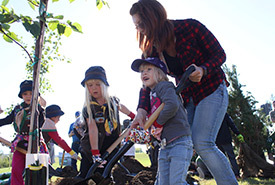 In fact, Scouts across Canada have planted more than 80 million trees through the program since it began in 1972. Scouting youth have also led other environmental initiatives, like building bee boxes to conserve and protect bee populations. This allows pollination to continue and sustains the health of forests. With every tree planted, a seed of hope is placed for the next generation of youth, who will carry the responsibility of caring for our planet. As Scouts, we’ll keep doing our part to protect our home away from home: the great outdoors. The global situation of depleting forests is indeed serious, but there are many opportunities for us all to help, such as following the three Rs (reduce, reuse, recycle), volunteering with the Nature Conservancy of Canada, donating to Scoutrees or joining your local Scouts in a community planting project. Through these simple actions, and others, what was once lost can be regrown again. "Heard it from a Scout" is written by members of Scouts Canada’s Youth Spokesperson program. This post was authored by Emma Savić Kallesøe. 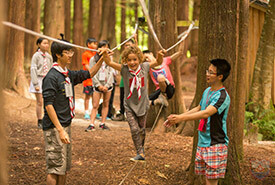 Scouts Canada is the country's leading co-ed youth organization, offering programming for boys, girls and young adults aged 5-26 in multiple languages, reflecting Canada's multicultural landscape and communities. Read more about Scouts Canada.